Size: 1,700 sq. ft. "m/l including Florida Room & Lanai"
Sellers are almost completely packed and this home needs new people to love it. Great vaulted ceilings in this extra-large almost 1,700 sq ft, 1975 SUNC 2/2 home perfect for entertaining friends & family or relaxing after a hard day living your Florida lifestyle on the nearby beaches of Fort Myers Beach, Sanibel & Captiva or in the beautiful, friendly gated Buccaneer Estates. 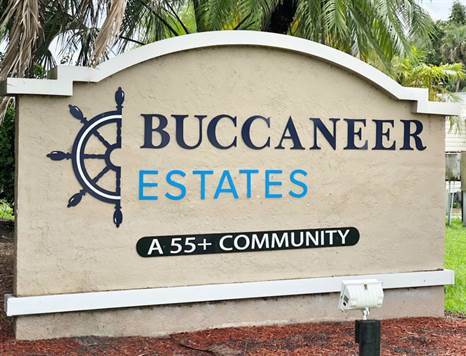 Buccaneer Estates has 2 heated swimming pools, a hot tub, club house, sauna, two exercise rooms, putting green, shuffleboard, hospitality house, billiards, horse shoes and multiple lakes for your enjoyment. This house has a large lanai with screens & glass windows, a large Florida Room with screens & glass windows, an 10x8 shed/laundry room. This home will be unfurnished except for refrigerator, dishwasher, stove, washer & dryer. BONUS ITEMS soaking tub & step-in shower in the master suite, NEW roof over, NEW A/C, NEW subfloors, NEW finish flooring (ceramic tile & laminate), NEW water heater, & NEW fixtures in bathrooms, & a beautiful NEW backsplash in the kitchen. Lot rent is approximately $816 and includes lawn care and use of all amenities. Other fees are a pass-through tax, water, sewer, and trash and add approximately $80 to monthly lot rent bill.